Speedwell is a creeping perennial weed that will quickly take over a lawn in just a few years if left to do so. There are over 95 varieties of this weed with about a dozen that occur regularly within home turf; Creeping or Veronica Speedwell being the most prominent in our service area. Creeping Speedwell is most noticible in April to May due to its blue and white flowers. A little about Speedwell – Like most of the early spring weeds, speedwell is a perennial. Over the winter this weed does not die off like an annual would, but remains in the lawn in a vegetative state waiting for the spring temperatures to come. Speedwell grows low to the ground in dense mats, spreading very quickly once it has established itself in your lawn. This weed prefers moist, shady soils and acts very similar to ground ivy aside from its blue and white flowers. How did THAT get into my lawn? – Being a perennial, speedwell will germinate and spread through a number of ways. The plant produces from seed that germinates over the late fall and early spring but also will create new root systems from nodes on an existing plant. Even a single piece of root system can lead to new plants, making pulling speedwell from the lawn a bad idea. Often, speedwell spreads into a lawn from greenhouses and landscape beds because it is sold as an ornamental ground cover by nurseries and landscapers. What can I do? 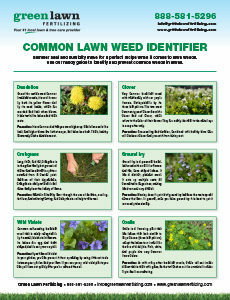 – There are a few ways to combat this persistent weed. 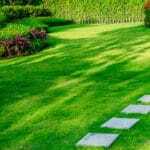 Raising mowing height to the proper 3.5” height and increasing the sunlight of an area will help to reduce its competitiveness. If conditions are not good for speedwell, its root system will not be as strong as other plants, like grass. This will keep it from being able to dominate as well and create a good environment for weed control to do the most good. Since speedwell is so aggressive, you may need multiple herbicide treatments to completely control each plant. 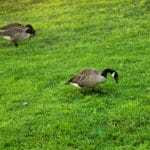 As the speedwell begins to die off, it is important to maintain a dense, healthy turf that will fill in the areas left behind by the weed removal. 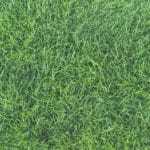 Maintaining a dense stand of healthy turf will keep other plants such as weeds from germinating and filling in these areas. 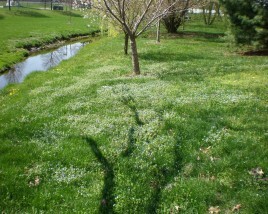 Regular applications of fertilizer spread 4-6 weeks apart as well as weed control will keep your lawn thick and green. 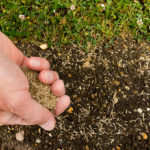 At the end of the season, mid-late fall, you should consider a full aeration and over-seeding to strengthen the root system of your lawn and help fill in any small patches left behind from weed removal, drought stress, disease, or insect damage. This will ensure that the each spring will be better than the last.